Allie Kestner & her family hosted VBF BFLO, a fundraising event in Buffalo, NY, on Saturday, October 6, 2018, which raised almost $3,000 for the Vascular Birthmarks Foundation! VBF is grateful to Allie and her family for leading awareness efforts in the birthmark community. READ MORE about Raising Awareness with Lola. 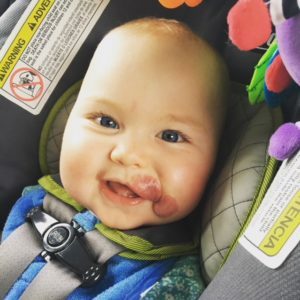 Just hours after our daughter Lola was born, the faint bruise-like spot on her lip and cheek started to grow rapidly to become a raised lesion very deep red in color. 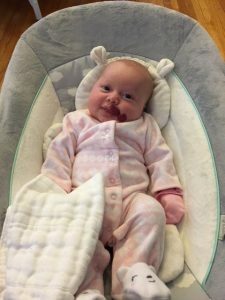 By the time she was two weeks old, and we noticed that the mark was also growing inside of her mouth, we knew that this was not something that would “just go away,” and made the call to our pediatrician. Though we were very happy with the team of doctors at our pediatrician’s office, they did not have enough knowledge about Lola’s birthmark, and referred us to the best pediatric dermatologist in Buffalo at Children’s Hospital: Dr. Ilene Rothman. Dr. Rothman knew at first glance that Lola’s birthmark was a hemangioma. This type of birthmark was very foreign to us, and we immediately did as much research as possible. Any information we found on medical websites stated that this birthmark would grow until she was about 6-9 months old, stop growing at a year, and then start to involute until it disappeared by age 7-10. There was even a small blurb about “strawberry birthmarks” in my What to Expect the First Year Book; however, each bit of information I read led me to believe that this was “no big deal” and it would “go away”. In my heart, I knew that this birthmark had already deformed her face and she was only a few weeks old. This was not just going to go away. Due to the placement and rapid growth of Lola’s hemangioma, this reality was terrifying. As parents, we were absolutely crushed and beyond confused. Yes- Lola was a very healthy baby. She did have acid reflux, which was difficult enough in itself and required medication, but we knew, and were constantly reminded by many people around us that “things could always be worse”. On top of my feelings of confusion and fear, I then felt guilt for being so upset over a birthmark with comments like these. 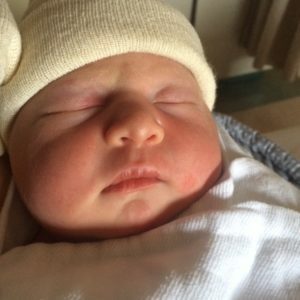 As a new mother, I was heartbroken, confused, and extremely worried about my baby girl. I was terrified to take her out into public, and didn’t do so much in the first year, because I could not tolerate the thought of outsiders looking at my precious baby like she was different or that something was wrong with her. When I would take her out for a walk, my heart would pound when a neighbor would approach to look at the baby. I was so protective, and still am. Many might think that something like this is purely cosmetic; however, this birthmark was growing rapidly, and I did not know the effect it could have on her in the formative years of her young life. Dr. Rothman immediately wanted to begin treatment: propranolol- another word that was foreign to us. Lola had to first see a pediatric cardiologist for an EKG test to ensure her heart was healthy enough for the medication, even though the dose she would be taking was extremely low. Luckily, she did not have a single negative side effect from the medication. 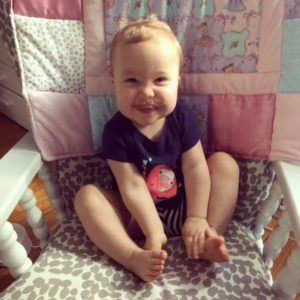 Dr. Rothman’s nurses and the cardiologist were so certain that propranolol would work its magic rapidly for Lola because they had witnessed the success many times before for other babies. We were so excited and hopeful. For Lola, however, her hemangioma did not respond to the propranolol. Dr. Rothman, although amazingly knowledgeable and highly experienced, did not have a next step for us. 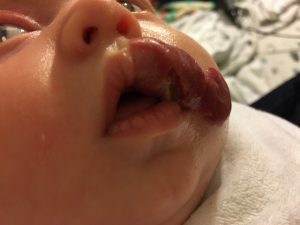 It was around 6 weeks of age that the portion of Lola’s hemangioma on her lip ulcerated, and became an open wound that caused her a great deal of pain and made eating very difficult. Months later, we were informed that ulcerations are extremely painful, and to a much higher degree than just a regular wound. Luckily, the propranolol did help to close the wound within a few weeks, but it did not help to shrink the size; the hemangioma only continued to grow. After the scarring experience from her ulceration, we craved the next step in her treatment, but did not know where to find it. We were then referred to another doctor in Buffalo who suggested a steroid injection, which also did not help to stunt the growth. This doctor then proposed a laser treatment inside the mouth to help take away some of the bulk. The laser that would be used for this procedure was a YAG laser- stronger than pulse dye laser. We were hesitant, but the doctor ensured us he would do the same for his own baby. So, we went ahead with the laser. The recovery for this treatment was tremendously painful for our baby for a solid week, and two weeks after the procedure, Lola ended up in Children’s Hospital for two nights with excessive bleeding. At this point, we were feeling utterly hopeless, and as a mother, I did not feel I could possibly put my baby through another painful treatment. I was in a very dark place. The last night of our hospital stay after the remnants of the unsuccessful laser treatment, I reached out on social media to the Hemangioma Parents Group on Facebook that I had joined when Lola was only a month old. The parents in this group were my sole source of comfort and reassurance because they understood exactly what we were going through. I was desperate and looking for any help or words of advice that I could find. It was that night, minutes after my post, that Dr. Linda Rozell-Shannon- founder of the Vascular Birthmarks Foundation- answered back and changed our lives forever. The next day, we got home from the hospital, and Dr. Linda told me to call her. She talked to me for nearly an hour- comforting me, explaining that Lola’s hemangioma was, what she calls, “persistent and resistant”, and she educated me more about hemangiomas in that hour-long phone conversation than I had learned in my five plus months of research. She informed me that not all hemangiomas need treatment, but 10% NEED treatment due to their location, size, aggressiveness, etc. Then, she told me something terrifying: if the proper treatment was not done soon, Lola could lose her lip line completely. Not only that, the portion inside her mouth could impede speech development, push her teeth back as they grow, etc. My mind was spinning, and my first thought was to be angry at the doctors that we had been trusting all along. I now realize that the doctors treating Lola up until that point were highly skilled in their expertise, and were very caring; however, Lola needed a hemangioma EXPERT. At the end of the phone conversation with Dr. Linda, Lola had a consultation with Dr. Waner of the Vascular Birthmark Institute in NYC. A couple weeks later, we were off to The Big Apple with our 6 month old baby to see a world-renowned vascular birthmark specialist- a man who spent his days changing the lives of children with vascular anomalies. It was a surreal experience. We had finally found the right doctor. The moment I met Dr. Waner, I knew that he was the only person who could help Lola. The first thing he said was “she will be fine”- his demeanor was so calm, reassuring, and confident…and I believed him with my whole heart. He knew exactly what needed to be done, and exactly how to do it. 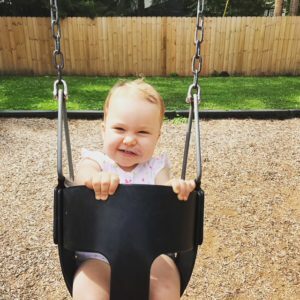 For the first time since we had begun the hemangioma journey, I finally felt as though I could take a deep breath and put my faith in a doctor. Dr. Waner told us that if we did not consider surgical intervention, Lola’s lip line would never be normal, but stretched, leaving her mouth asymmetrical. I think all parents want to give their children the best chances possible, and we wanted to give Lola that chance. When Lola was just a month old, my husband and I made the promise to each other, and to our daughter, that we would not stop until we found the right treatment. In her short 6 months of life, people (other than her family of course) did not see Lola for the beautiful, smiley baby that she was- many gawked at her birthmark- some with looks of disgust and confusion, which was heartbreaking. Not to mention the pain and discomfort that this birthmark had already caused our baby left us deeply saddened. Lola had her first surgery with Dr. Waner when she was 7 months old. 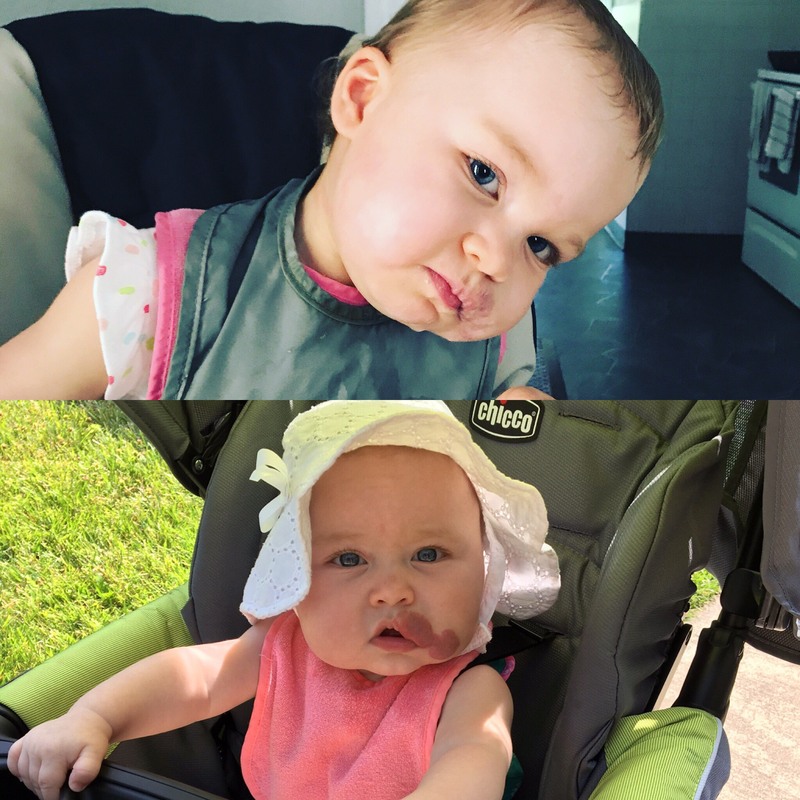 Now at 21 months, Lola has had four surgeries: three of the surgeries to debulk the mass of her hemangioma, inside of the mouth and out, and a couple lip line adjustments and laser treatments with each surgery. Before our connection with Dr. Linda and Dr. Waner, we were parents that had exhausted our resources and, on some days, felt complete despair. Though Lola still has a few treatments ahead of her, our sweet baby girl is in a place now with her birthmark that we could have never imagined a year ago. Her surgeries with Dr. Waner have been amazingly successful, and her recoveries- though not always a breeze- were manageable and very well-tolerated by Lola. We are hosting a fundraiser in Buffalo this fall because Dr. Linda, the Vascular Birthmarks Foundation, and Dr. Waner have changed our lives, and have given our daughter the chance to be seen for the beautiful girl that she is. Our goal of the fundraiser is to, of course raise money for this amazing foundation, but also to raise awareness in our community about vascular birthmarks, and to shed light on the fact that hope is never lost. This journey, though difficult in the early months, has taught us so much and has made us stronger as a family. We are excited to give back to the people and the foundation who took our baby girl under their wings!